Walt Whitman (1819-1892) was greatly influenced by the work of Ralph Waldo Emerson. Whitman said, “I was simmering, simmering, simmering. Emerson brought me to a boil.” Whitman tried to fulfill the call Emerson made in such essays as “The American Scholar” and “The Poet” for a poet who would see the value of common things and be a radical departure from the conventions of the past. I am not blind to the worth of the wonderful gift of ‘LEAVES OF GRASS.’ I find it the most extraordinary piece of wit and wisdom that America has yet contributed. . . It meets the demand I am always making of what seemed the sterile and stingy nature, as if too much handiwork, or too much lymph in the temperament, were making our western wits fat and mean. I give you joy of your free and brave thought. I have great joy in it. I find incomparable things said incomparably well, as they must be. I find the courage of treatment which so delights us, and which large perception only can inspire. I greet you at the beginning of a great career, which yet must have had a long foreground somewhere, for such a start. Thoreau met Whitman in 1856. Thoreau and Bronson Alcott traveled to Brooklyn with the express purpose of meeting Whitman, which they did. Thoreau was a surprising fellow — he is not easily grasped — is elusive: yet he is one of the native forces — stands for a fact, a movement, an upheaval: Thoreau belongs to America, to the transcendental, to the protestors: then he is an outdoor man: all outdoor men everything else being equal appeal to me. Thoreau was not so precious, tender, a personality as Emerson: but he was a force — he looms up bigger and bigger: his dying does not seem to have hurt him a bit: every year has added to his fame. One thing about Thoreau keeps him very near to me: I refer to his lawlessness — his dissent — his going his own absolute road let hell blaze all it chooses. 19 November 1856: He is apparently the greatest democrat the world has seen. Kings and aristocracy go by the board at once, as they have long deserved to. A remarkably strong though coarse nature, of a sweet disposition, and much prized by his friends. Though peculiar and rough in his exterior, his skin (all over (?)) red, he is essentially a gentleman. I am still somewhat in a quandary about him, — feel that he is essentially strange to me, at any rate; but I am surprised by the sight of him. He is very broad, but, as I have said, not fine. He said that I misapprehended him. I am not quite sure that I do. He told us that he loved to ride up and down Broadway all day on an omnibus, sitting beside the driver, listening to the roar of the carts, and sometimes gesticulating and declaiming Homer at the top of his voice. 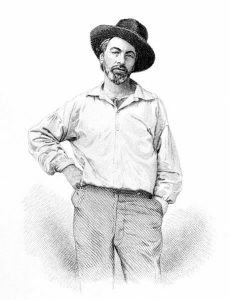 7 December 1856: That Walt Whitman, of whom I wrote to you, is the most interesting fact to me at present. I have just read his 2nd edition (which he gave me) and it has done me more good than any reading for a long time. Perhaps I remember best the poem of Walt Whitman an American & the Sun Down Poem. There are 2 or 3 pieces in the book which are disagreeable to say the least, simply sensual. He does not celebrate love at all. It is as if the beasts spoke. I think that men have not been ashamed of themselves without reason. No doubt, there have always been dens where such deeds were unblushingly recited, and it is no merit to compete with their inhabitants. But even on this side, he has spoken more truth than any American or modern that I know. I have found his poem exhilarating encouraging. As for its sensuality, — & it may turn out to be less sensual than it appeared — I do not so much wish that those parts were not written, as that men & women were so pure that they could read them without harm, that is, without understanding them. One woman told me that no woman could read it as if a man could read what a woman could not. Of course Walt Whitman can communicate to us no experience, and if we are shocked, if we are shocked, whose experience is it that we are reminded of? We ought to rejoice greatly in him. He occasionally suggests something a little more than human. You cant confound him with the other inhabitants of Brooklyn or New York. How they must shudder when they read him! He is awefully good. I did not get far in conversation with him, — two more being present, — and among the few things which I chanced to say, I remember that one was, in answer to him as representing America, that I did not think much of America or of politics, and so on, which may have been somewhat of a damper to him. Since I have seen him, I find that I am not disturbed by any brag or egoism in his book. He may turn out the least of a braggart of all, having a better right to be confident. He is a great fellow.